It's been a while since the last installment of these Fortnightly(-in-name-only) Round-up posts, so I'm going to ease my way back into it by posting some happy snaps of food highlights that I've had about town since my return from Singapore and Hong Kong (related posts coming soon, honest). On my morning coffee run about a month ago, I noticed that the Japanese restaurant at 17 Liverpool Street formerly known as Aka Tombo had re-opened as Shimbashi Soba & Sake Bar, and the chef was standing in the front window making soba by hand - kneading, rolling and chopping. Chef Taka-san makes their soba fresh from organic ingredients every morning, and again in the afternoon if supplies are running low. 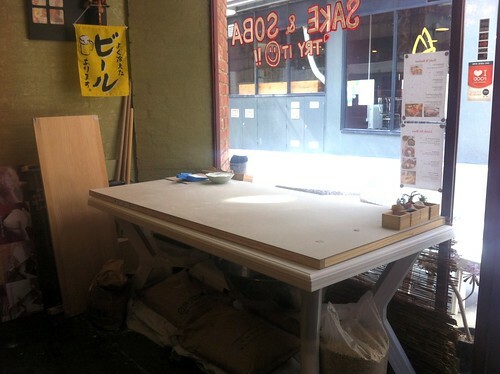 Read Lauren's blog post on Footscray Food Blog for a more detailed description of the process. My favourite way to eat Shimbashi's soba is as soba seiro, served chilled on a mat alongside spring onions, wasabi and a dipping sauce known as tsuyu. At the end of the meal be sure to ask for the soba-yu (the liquid the soba have been cooked in): add it to the leftover tsuyu and drink it like a soup. While we're talking Japanese food: I've written before about my love of the tsuke sashimi salad at Purple Peanuts on Collins Street. What I discovered recently is that I like it even better with brown rice ($1 surcharge) instead of white. 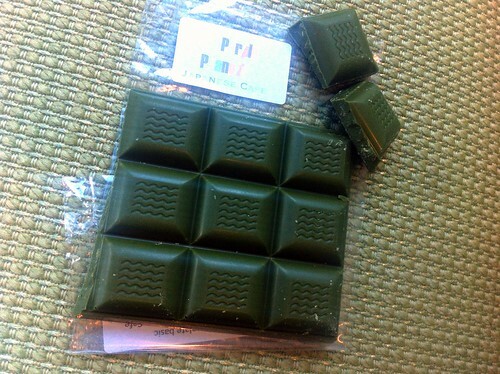 Their house-made matcha chocolate is also very very good, the green tea tannins nicely balancing out the white chocolate sweetness. 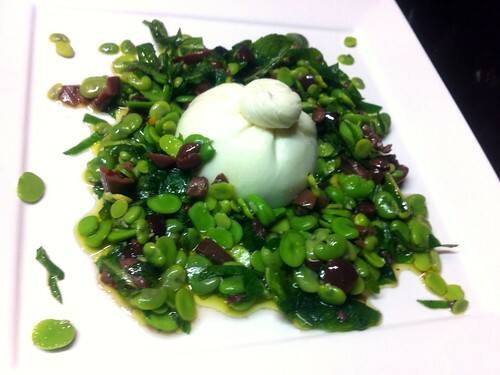 A sensational salad of burrata, broad beans, olives and mint that I was lucky enough to enjoy at my aunt Paola's house a few weeks ago (recipe on her blog Italy on my Mind). 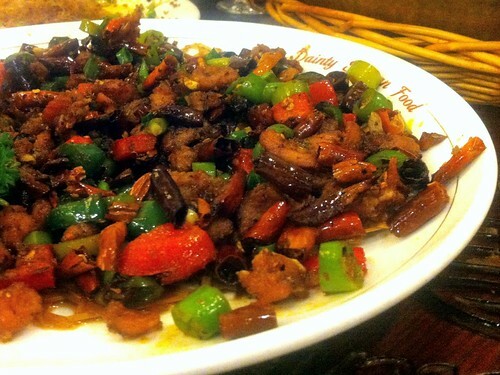 One of the new dishes on the Dainty Sichuan menu is the cumin chilli rabbit, a variant on the cumin lamb slices (my favourite Dainty dish, narrowly beating the fish flavoured eggplant). As delicious as the rabbit was, the fiddliness with bunny bones means I'll be back on the lamb slices next time. 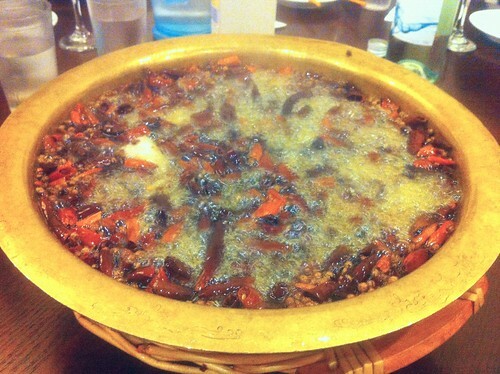 We also braved the dish entitled "boiling fish in golden basin" for the first time: while it arrived looking completely TERRIFYING, bubbling like magma from Mount Doom, the slices of fish that were sieved out turned out to have a surprisingly mild and delicate - well, relatively speaking - flavour. Recommended! Walk, don't run, to Chin Chin to try their newest dessert: coconut sago with sweetcorn ice cream, praline and puffed wild rice. The menu at Neapoli, Con Christopoulos' latest venture, is a mash-up that veers wildly from continent to continent: brown rice nori rolls sit alongside spanakopita, curries, chilli con carne, ceviche, tempura and rabbit stifado. 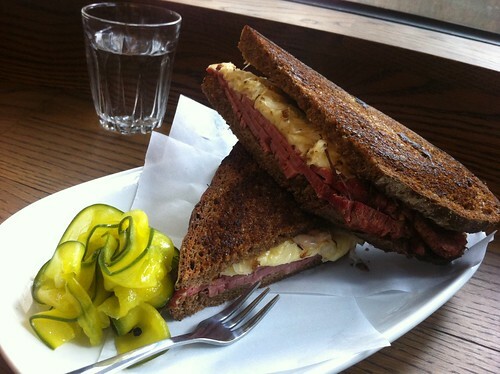 I can however vouch for their epic Reuben, and am glad to see it featured in Epicure's recent list of Melbourne venues serving the increasingly popular sandwich. 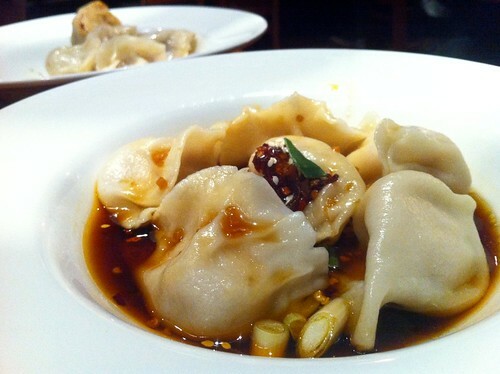 The dumplings at I Love Dumplings on Bridge Road are good. Really good. Their Urbanspoon entry has the predictable whinges about vague waitresses and long waits for orders so I went there on Sunday night expecting lousy service, but was pleasantly surprised. Thanks to our American visitors Dan and Claire for finding this place and telling me about it! 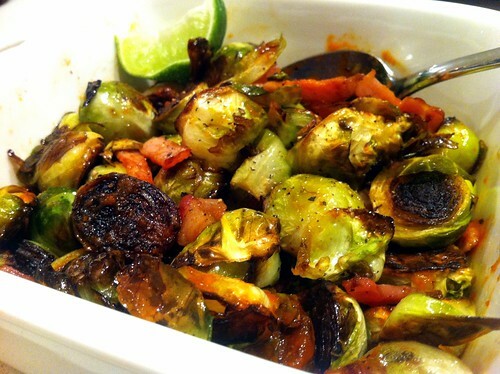 And thanks also to Dan and Claire for sharing with me their favourite way to cook Brussels sprouts: think bacon, lime and sriracha. Here's a recipe on The Paupered Chef for this method, which is in turn based on a David Chang recipe in GQ. I made the sprouts pictured below last night, and while they may not be pretty let me assure you that they're ridiculously tasty. - "Reviewing restaurants is a bit like being put out to stud: the basic activity involved may be pleasurable, but when you have to do it, and with whom you're told, it loses a lot of its appeal." Andrew Colman on whether restaurant critics are an endangered species. - Two cute cakes: a Tetris cake with macarons on Raspberri Cupcakes (love the animated gif), and a polka dot cake on Once Upon a Pedestal. - Essjay sends depressing dispatches from the Royal Melbourne Show Baking Competition, where judges advocate using custard powder and a past winner advises others to use supermarket eggs instead of free range eggs, because "some judges don't like yellow sponges". - Stickifingers on supermarket vs free range eggs. - "It’s like a miniaturization of all my favorite cities: Tokyo and Seoul and New York and Los Angeles, all in one." Roy Choi on why he loves Melbourne. - Craft beer gaining traction in Paris: love the look of this beautiful shop in Montmartre. 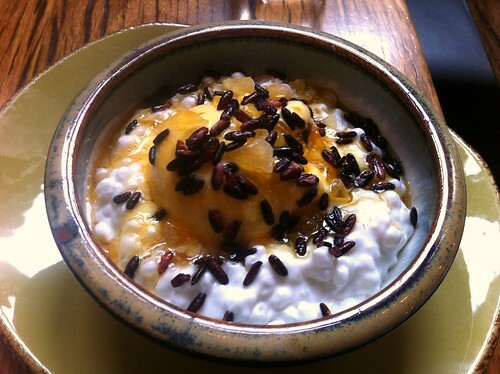 - Has Tasmania reached a [culinary] tipping point? Steve Cumper offers a chef's perspective. 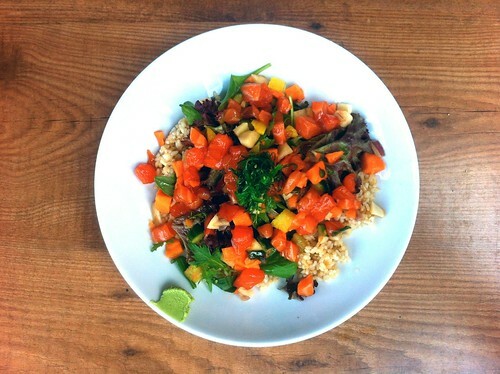 - Cook Republic on 10 social and community websites to drive traffic to your food blog. I've never used any of them, apart from tinkering with Pinterest for personal, non-Melbourne Gastronome purposes, but they may be of interest for other food bloggers (especially those with recipe blogs). - Baristas vs customers: how we can all get along. 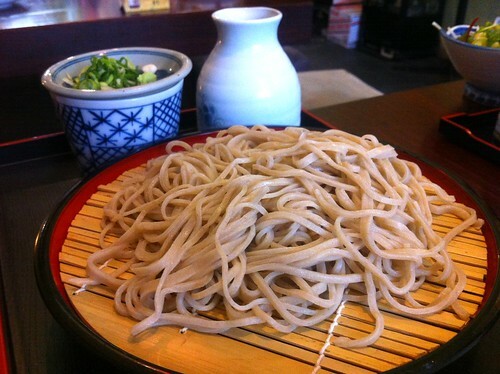 Am getting soba envy from your post! Also, nice to have a dessert flashback from that awesome Chin Chin experience. Thanks for the amazingly kind mention of the podcast and the blog, too. Very lovely and generous of you, Claire!